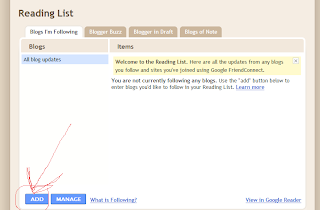 I realize that many out there are new to blogging so I wanted to do this easy to understand tutorial so that you will be able to successfully follow blogs. 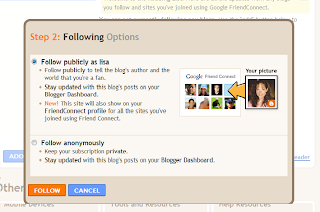 There are a couple of ways you can go about following blogs via Google Friend Connect. 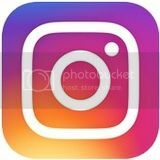 Look at my page, you will see on the upper left hand corner the link "follow" all you have to do is click the link and you will now be following my blog. 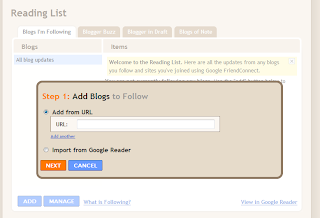 Another way you can accomplish this is by looking on a blogger's sidebar. 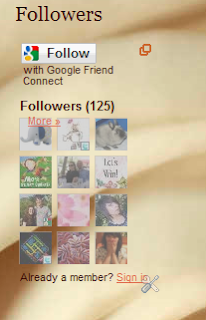 You will usually find the the option to follow with Google Friend Connect. Here you can just click on the "follow" and you will get a verification to confirm that you intended to follow the blog. Just confirm and you are set. The whole process takes about one second. 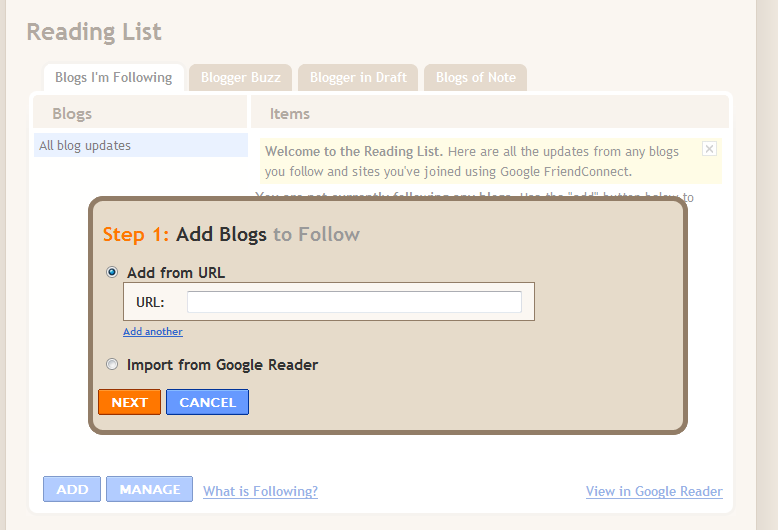 You can also add a blog from you dashboard. 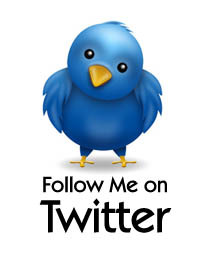 Type in http://www.nyaproductreviewer.com/ and click next..
Now just check 'follow publicly' and hit follow and your done. How do I sign up for Google Friend Connect? Oops I just now noticed your comment I can see that you already figured this out. I noticed you have a Google account but i don't think that is necessary. The second step should suffice. @Randy..make sure that you are following publicly and not privately. Thanks for the info on how to do this! I didn't know how to follow if there wasn't a widget on the blog. This is SUCH a useful tutorial, I don't know HOW many people have asked me what GFC is in the first place. Sigh, they ALL need to read this. That was very helpful, thank you. I had no idea how to use this and wondered. Very informative. Thanks. I tried o do this on your other posts but the "jump to posts" wouldn't work. You have a great site with great information. Thanks for this. I hate that there is always a delay on my computer for GFC to show up. I am going to have to look up all your tutorials. 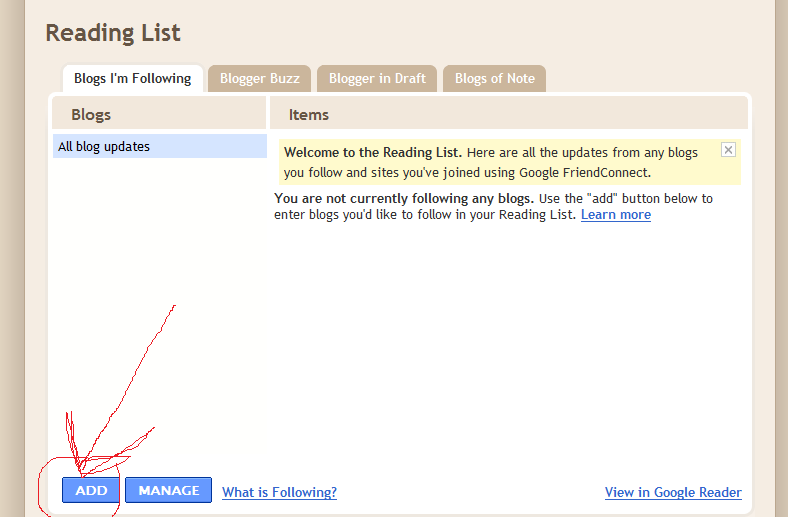 Sometimes when entering a giveaway, I have no idea what the blogger is asking; I could use help. The info on Friend Connect was very helpful. Thank you. This will go to my Facebook, & I too, needed this help. Even simple blog posts like this are SOOOO useful! When i first started I could've used this, because I had no idea!